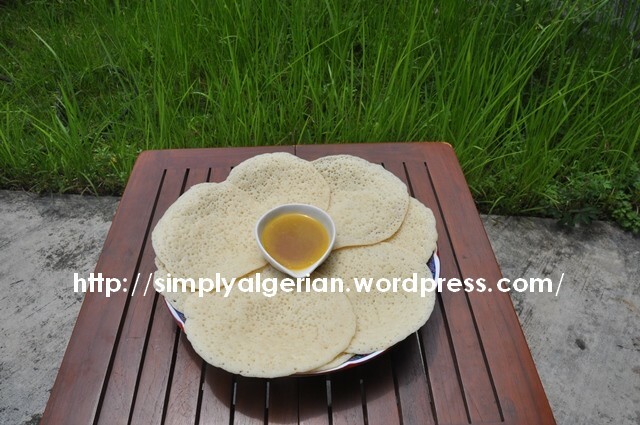 Baghrir is an North African honeycomb-like pancake, very much appreciated in Algeria and Morocco. 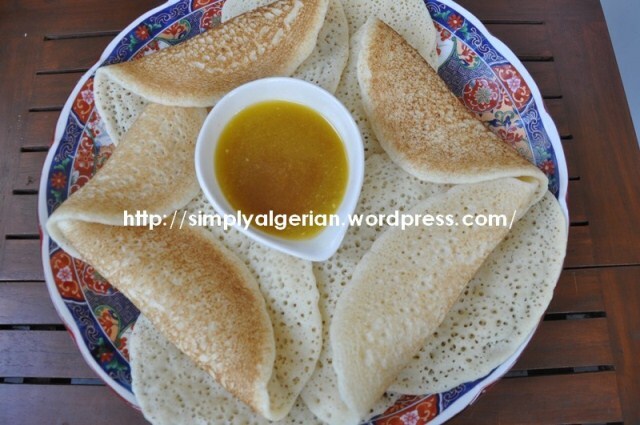 Both Algerians ans Moroccans like to serve these pancakes as an afternoon treat alongside butter and honey, sugar, olive oil…..etc…..but what I find interesting is that baghrir is a part and parcel of a typical Moroccan iftar table ( Ramadan fast- breaking ) while in Algeria it’s prepared all year round except during the holy month, during which othoman influenced dishes and pastries such as , ktayefs ( called kunafa in middle-east ) , halwat turk ( turkish halva), halwat halkoum ( turkish /delights ) are preffered…. Both countries have numerous dishes in common especially those of amazigh and andalusian origin but because Morocco didn’t fall into the othoman rule like its North African neighoubours, Ramadan tables of Algeria have more similarities with their Tunisian neighbours due to their common turkish heritage than of Morocco. Isn’t interesting how political decisions throughout history influence our palate ? 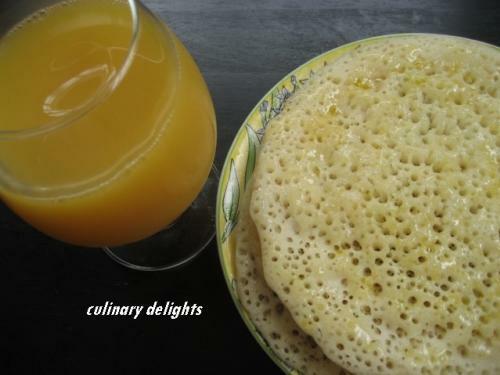 After getting married overseas and living in a multiracial university society , I discovered that people of the horn of Africa ( Ethupia, Somalia, Eriteria….and by extention their neighbouring arab country of yemen ) have a similar, baghrir like pancake, called enjeera in Ethipian, canjeero in Somali or lahouh in Yemeni. 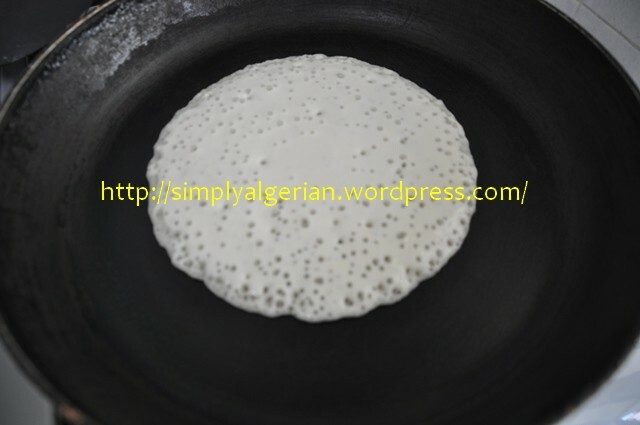 their pancake which is much more lighter and bigger than our baghrir plays a role of bread and is prepared daily to accompagny different dishes . 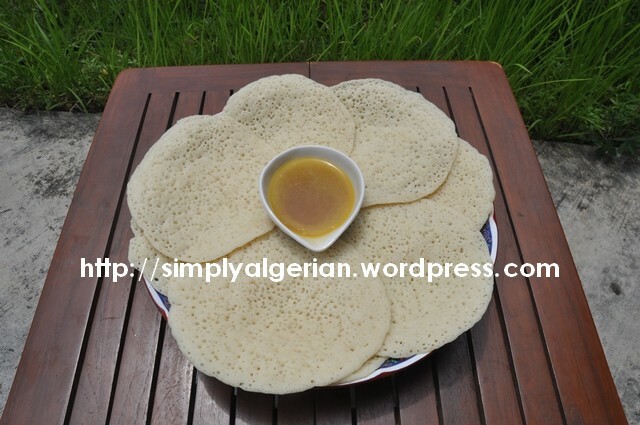 When eating, several « injera » are layered and topped with small portions of differents stews. the pancakes are then torn into pieces and dipped into the stews. lahouh the yemeni version is prepared during ramadan to make a very refreshing appetizer called shafout…..
Due to the vast surface of the country. baghrir like many other dishes doesn’t have a single unique name in Algeria . In the Eastern part of the country it’s called ghrayef, in Constantine » korsa », in Kabylia » tighrifin » and in Algiers and the rest of the country….it’s simply Baghrir….. Even when I was a teethless little girl with with two plaits , I have always loveeeeeeeed baghrir . 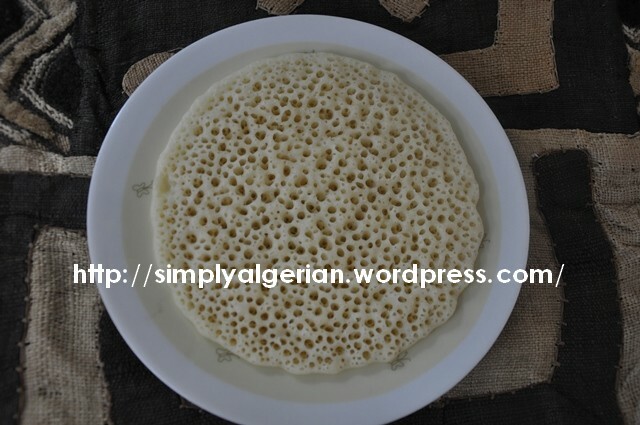 in those days , the whole processes would take hours between kneading, fermenting the dough and cooking the pancakes…I remember my grand mother ordering us , the children, to go out of the kitchen because laghreyef « dont like eyes » !!!!! 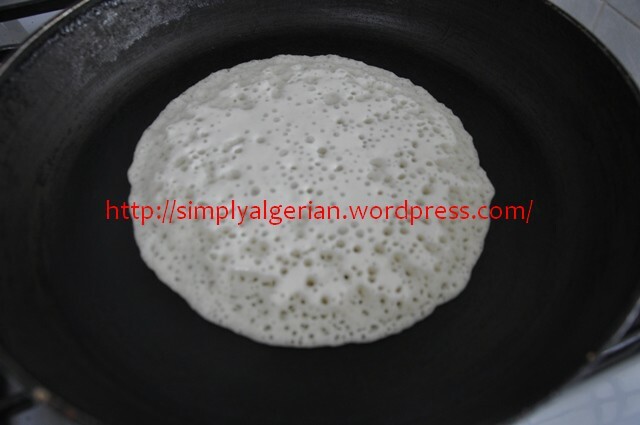 the cook has to be on her own in the kitchen, the more you have people around watching you cook the baghrir, the less holes you would get….knowing that the success of the pancake is juged according to the number and the size of the holes you get. Nowedays, all these steps are summed up thanks to technology…you only need a good recipe , and a blender ! our grandmother nevers weighed the ingredients , they just worked by feel, mixing semolina, yeast and water and had the most perfect baghrir ever. -In order to get a perfect baghrir, the amount of yeast should be considerable , eg, a simple bread recipe requires 1 tablespoon of yeast for every 500g of flour. the baghrir requires 2 tables spoon for every 500g of semolina. 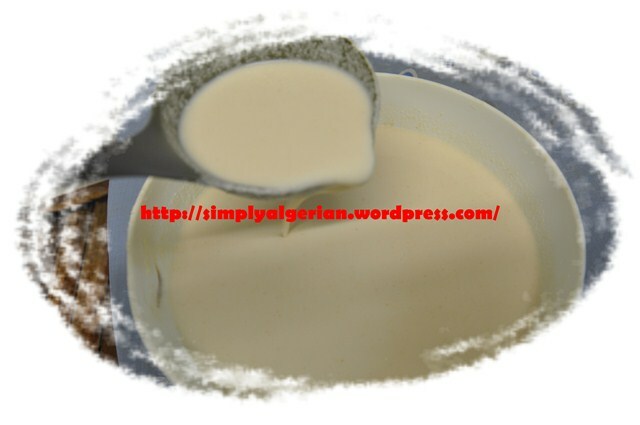 -The amount of water determines the succees of baghrir, the batter should creamy , almost liquid. if it is heavy, you’ll end up with few holes, in that case you should add more warm water and wait for at least 10 mn before start cooking. your pan should be well heated before pouring the batter. after cooking several pancakes, your pan will be very hot. you should think of reducing the heat as soon as the honeycombes start forming if not you’ll overbrown the underneeth. water, or mixture of water and milk for a softer pancake ( I prefer not to give an indication for the amount needed as my semolina absorbs liquids very fast. 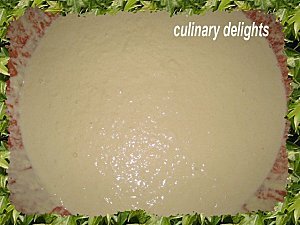 The batter should be creamy, almost liquid). PROCEDURE:pour the dry ingredients in the kitchen -aid or a blender. 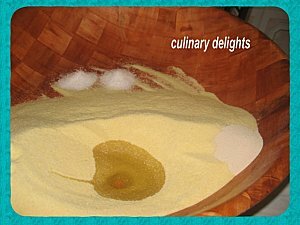 if using a small blender , put half of the semolina first, then water then finish with the rest of semolina. 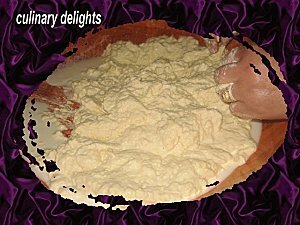 mix for frew minutes until you get a smooth , lumpless batter. cover and leave to ferment for one hour or so until it doubles in size and lots of bubbles appear on the surface. stir the batter thouroughly . greese a non-stick pan with a papertowel deeped in oil. heat it up over medium heat. use a medium sized laddle to scoop the batter. the quantity scooped depends eventually on the size of your pan. as soon as your pour the batter into the pan the honeycomb holes will immediately start forming, cook the pancake intil the pancake dries up. remove from the pan and set on a big plate or a clean towel. don’t flip to cook the other side nor pile them when still hot , otherwise they will stick to one another . coat them with a mixture of melted butter and honey, or butter and sugar, olive oil ….etc……..
Je ne prentends pas detenir la meilleure recette de baghrir …mais voudrais , par ce present post, partager avec vous les astuces que j’ai tire’ de mes propes echecs . d’autre bloggeuses vous donneront des astuces differentes , voire opposees des miennes : moins de levure, poele froide…..etc…. 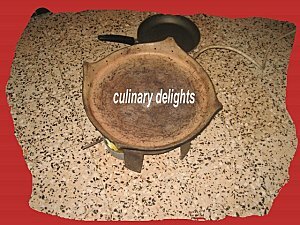 ce qui suit, est le resultat de mes observations, succes et echecs a travers les annees car j’ai toujours adore’ les baghrir et aimais le preparer , il m’arrivait de rater une recette qui m’a donne’ entierement satisfaction das le passe’. a l’epoque je m’ettais ca sur le dos de la semoule alors que c’etait probablement du a la quantite’ de l’eau que j’ai diminue’ sans en etre consciente. ce n’est pas l’ajout de l’oeuf, la quantite’ de la semoule, le melange de semoule, farine qui determinent le succes d’un baghrir . pour un pain ordinaire de 500g de farine, on met generalement, l’equivalent d’1 cas de levure . le baghrir necessite le double. pour 500g de semoule, je mets 2cas de levure de boulanger. je ne vais pas donner une quantite’ precise pour l’eau car ca dependera de la qualite’ de la semoule. y’en a qui absorbe l’eau tres vite et necessite moins de liquide que d’autres . l’essentiel est que le melange a crepe doit etre cremeux, semi liquide . s’il est lourd , vous obtiendrez peu de trous. dans ce cas rajouter de l »eau tiede et laisser reposer quelques minutes suplementaires avant de reprendre la cuisson. bien pre-chauffer la poele. quand vous etes au point d’epuiser la pate, pensez a reduire le feu des la formation des bules, car apres avoir cuit plusieures crepes , la poele devient tres chaude et cremara le dessous des dernieres crepes. assez d’eau [b]tiede [/b] pour avoir un melange onctueux , voire semi-liquide . vous pouvez melanger eau et lait . la crepe ne sera que meilleure. dans un blender , ou bien un kitchen-aide, mettre les matieres seches d’abord puis ajouter l’eau jusqu’a l’obtention de la consistance desiree’. si vous possedez un petit blender, mettez la moitie’ de la semoule d’abord, l’eau , mixez puis ajouter le restant de semoule. laisser reposer une heure, voire plus selon la saison. le melange doit doubler de volume et former des bules en dessus. remuer le melange pour faire le homogeniser et faire disparaitre les bules. tromper une serviette en papier dans de l’huile et passer la poele que vous avez pris soin de prechauffer . prendre une louche du melage et verser sur la poele. vous devez voir des bules qui se forment immediatement. laisser cuire jusqu’au dessechement de la crepe. a l’aide d’une spatule , enlever la crepe et la mettre dans une grande assiette. Ne pas superposer les crepes quand elles sont encore chaudes ne pas oublier de passer la serviette huilee’ de temps en temps sur la poele . presenter les baghrir avec un melange de beure fondu et de miel, ou bien , beurre et sucre, huile d’olive ou tout autre garniture de votre choix.